Oh hello, my old skincare buddy, Klairs! ❤ Roughly 3-4 years ago, I used to own alot of Klairs products and my favourites were the Blemish Cream (makeup foundation) and Black Sugar Facial Polish (facial scrub). Until today, I am still a huge fan of Klairs and my current favourite is the cute Mochi BB Cushion. 2. After massaging, do not wipe off with tissue but rinse off with lukewarm water for 2-3 times. 3. (Optional) You can use soap to wash away the remaining oil. To be honest, I am not a fan of oil-based cleanser (except for makeup remover). However, I appreciate how well it cleanses off the dirt on the skin, but using a mild cleanser to remove the oil residue is a must for me. I remembered trying this product before long time ago. Now the formula has been upgraded so I am tempted to try it out! The improved serum now has 21.5% of pure Vitamin C (last time only 20%), therefore it comes with better hydrating power, suppleness and absorption without any stickiness. 1. 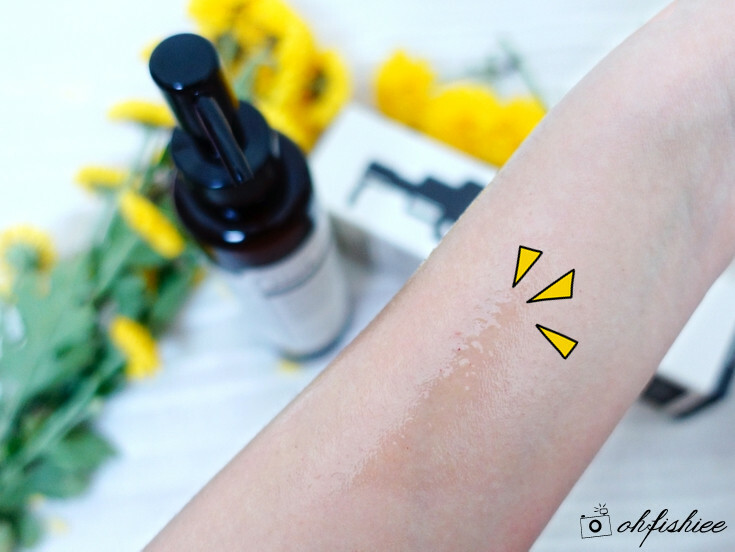 Press on the dropper and apply thin layer onto the skin. Honestly, the texture has improved so much! 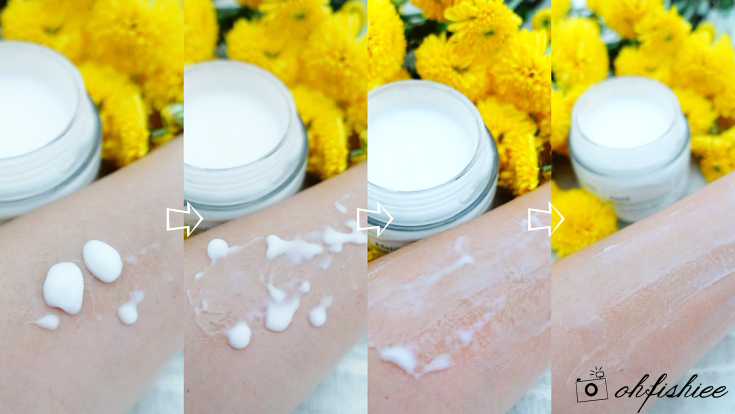 Now it is very lightweight, non-sticky and spreads easily over the skin. It takes up to 14 weeks to see visible results on the skin if you have acne scars or dull, tired skin. The antioxidant-rich Vitamin C serum can help nourish the skin, boost moisture and brighten skin tone. 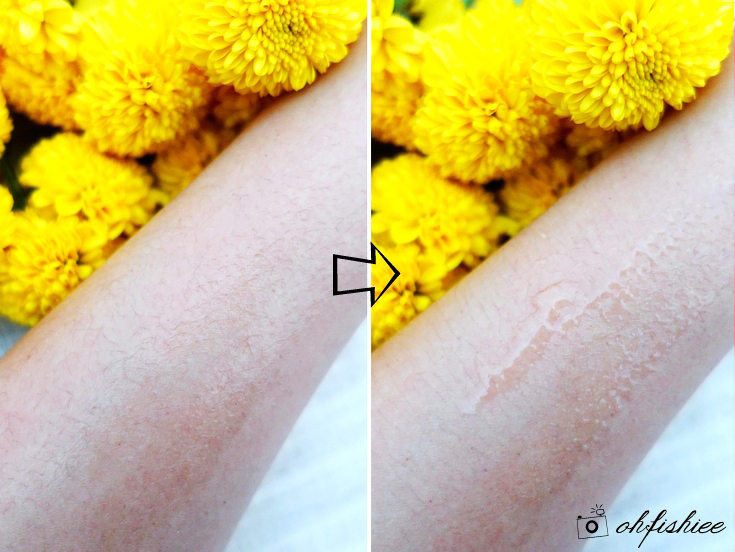 The acne scars will appear less visible too. *During hot weather, it is normal if the pure vitamin serum leaks out of the bottle. Therefore, it is recommended to keep it in the fridge. 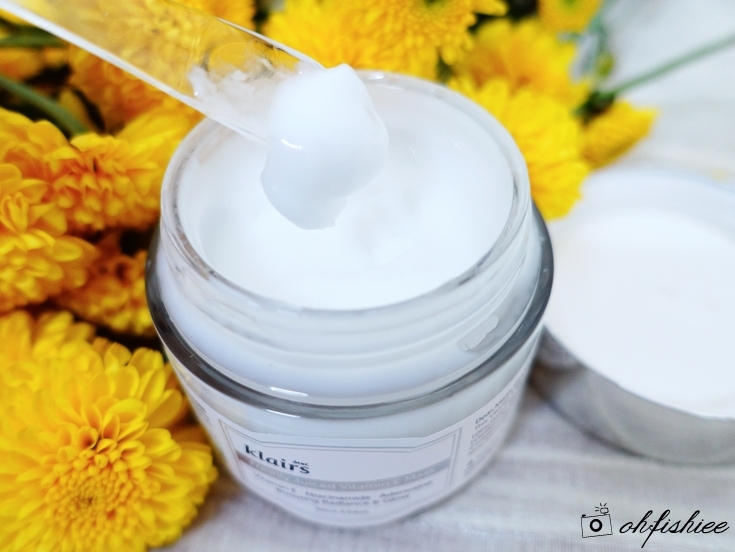 The KLAIRS Freshly Juiced Vitamin E Mask is most effective when used with vitamin C. It is a whitening sleeping mask for whitening, moisturizing and anti-aging benefits. Vitamin C Drop + Vitamin E Mask = Perfect DIY Duo! When Vitamin C and E combine, they enhance the effectiveness of each other through the antioxidant network and protect the skin from active oxygen, preventing aging. In addition, vitamin E prevents vitamin C from being oxidized before being absorbed by the skin, intensifying the skin-improving effects of vitamin C.
1. Apply thin layer over skin and wash off after 20 minutes. 2. Or mix the vitamin mask with the Vitamin C serum for an enhanced effect of additional brightening, wrinkle-repairing, and moisturizing with the antioxidant power. The Vitamin E mask has a very unique “shape memory cream” texture which feels like pudding / custard. The pudding-like texture transforms into a rich serum-like essence when in contact with the skin, sealing the skin with moisture for at least 8 hours. ❤ Dry, dull or tired skin. 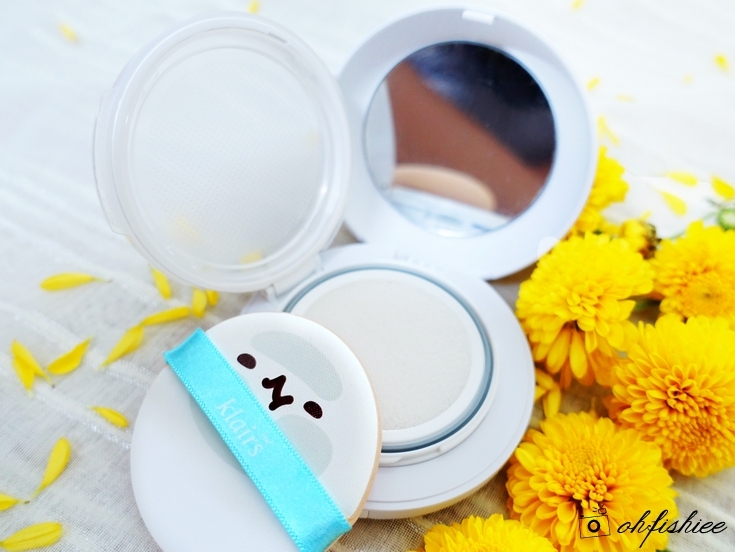 Lastly, Klair's most exciting product that I have been using is the limited edition Mochi BB Cushion. It is also Klair's all-time bestseller, because...nobody can resist such cuteness right? This is the third Mochi BB Cushion I have now -- You can tell how much I love it! Comes together with the cute mochi puff applicator, the cushion is designed as a balm-type product rather than a liquid-based cushion. Therefore, the improved formula is better able to fill the pores and give a better coverage that lasts for the day. Follow the above steps if you prefer maximum coverage with matte finish. ❤ (Moderate) For glow and more coverage: Use a cotton swab to press down the sponge for 1 minute to absorb the heavy balm-type formula to increase the coverage. ❤ (Difficult) For full coverage and very matte finish: Flip the sponge over before you start using the cushion. The cushion is available in only one shade i.e. apricot-beige that fits all skin tone. Whether you have yellow undertones or redness on the skin, it neutralises the color well and gives a natural brightened and healthy-looking coverage. I personally love the refreshing finish that it leaves on the skin. Coverage wise, it could be better but I like the lightweight texture that leaves the skin moist and breathable. If I were to recommend only one must-buy product, it would be the Mochi BB Cushion! 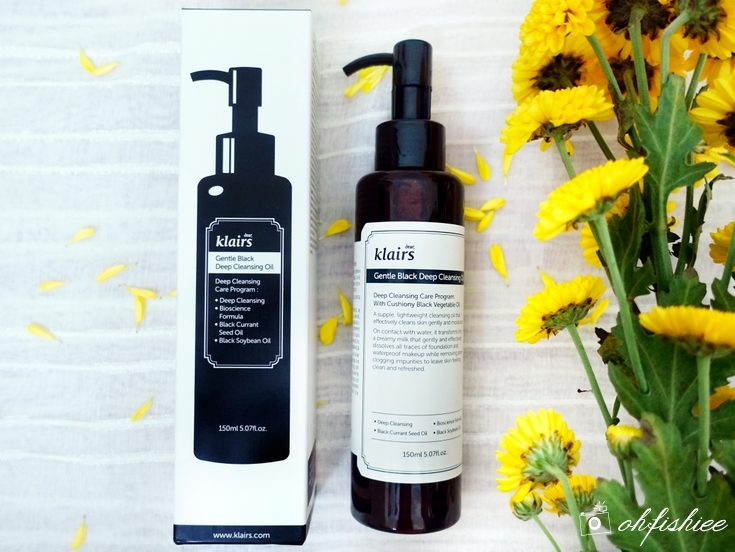 Klairs products are available at Hermo and several online shopping sites too.